Socrates, the great philosopher and teacher of ancient Greece, was once asked to tutor a young man in the art of oratory. The youth was very selfconfident and extremely talkative. Whatever came to his mind he blurted out, frequently interrupting his teacher. The philosopher, however, was patient, and persevered in his task. He put his student through the training and exercises which were required of an orator in that age. But when the course was over, he charged twice the normal fee. The student objected. "Why should I pay more than anybody else?" 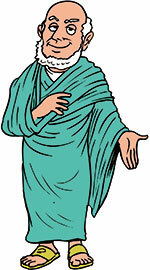 Socrates replied, "I not only had to teach you how to speak, I also had to teach you how to keep silent. "When you are talking, you are not learning," says an old adage. Another proverb tells us, "Silence is golden." There is a time to speak and there is a time to keep silent, and a wise person knows the difference. Silence is needed for a student who wants to learn. It is also necessary for anyone who wants to have friends, and exert a good influence on others. The over-talkative person is usually avoided. The good listener, on the other hand, knows how to keep silent, and is sought after as a source of consolation and advice, When this person speaks, his words are respected, because they are based on thought and reflection. charging a double fee, he taught the boy something more important---the value of silence.